Stripe payment module now offers Pay with Google, Apple Pay, Credit card, 3D-Secure, BITCOIN, ALIPAY, iDEAL, SOFORT, BANCONTACT, GIROPAY, Przelewy24, EPS, MULTIBANCO, SEPA Direct Debit with one Stripe account. 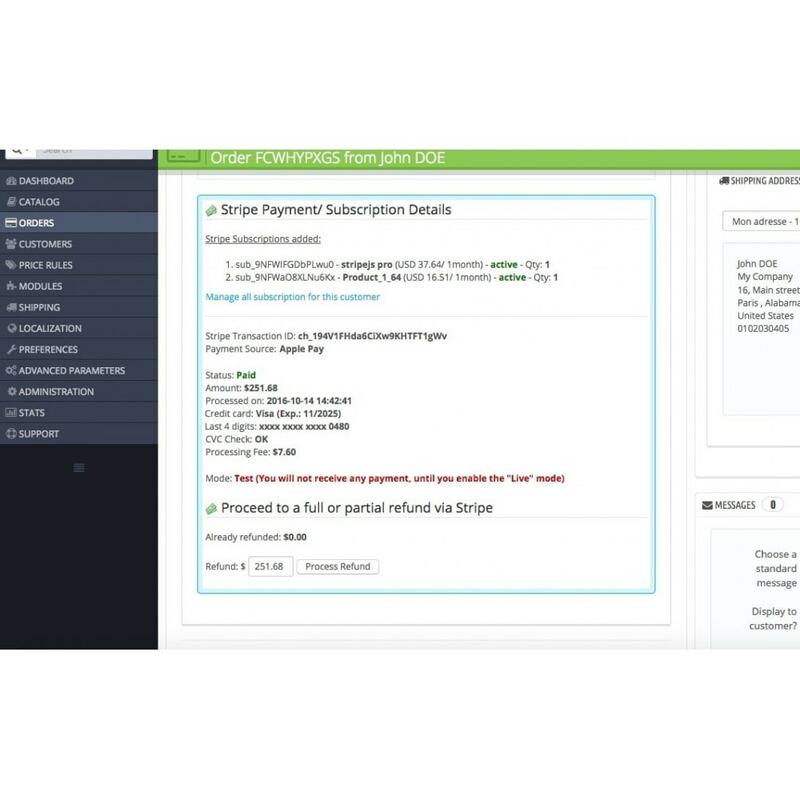 If you're looking for a payment module which support both Single + Recurring payments/ Subscriptions at the same time, then this is the module for you. Offer subscription or single charge with a product at the same time. 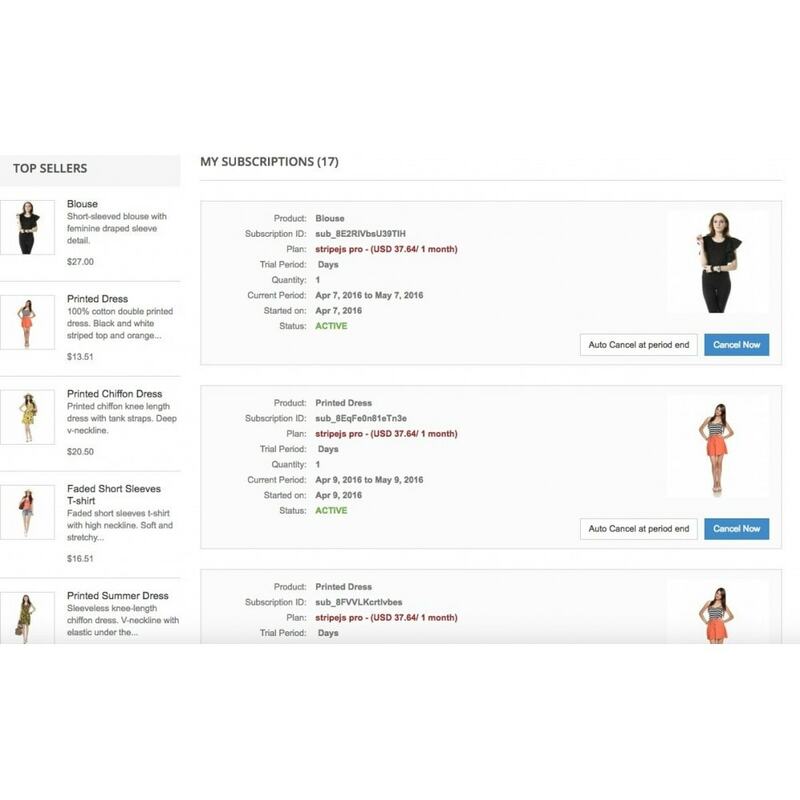 All payment options will be shown when all products in cart are non subscriptions. 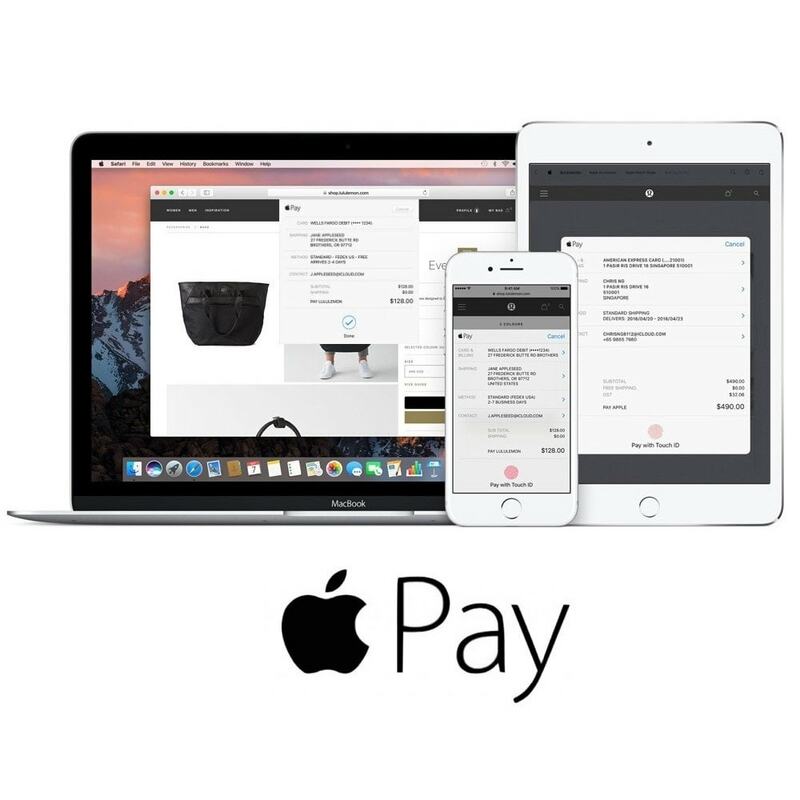 Pay with Google & Apple Pay is faster than any other traditional payment method. Customer don't need to type card details manually which time consuming. With Pay with Google & Apple Pay customers can checkout with one click. 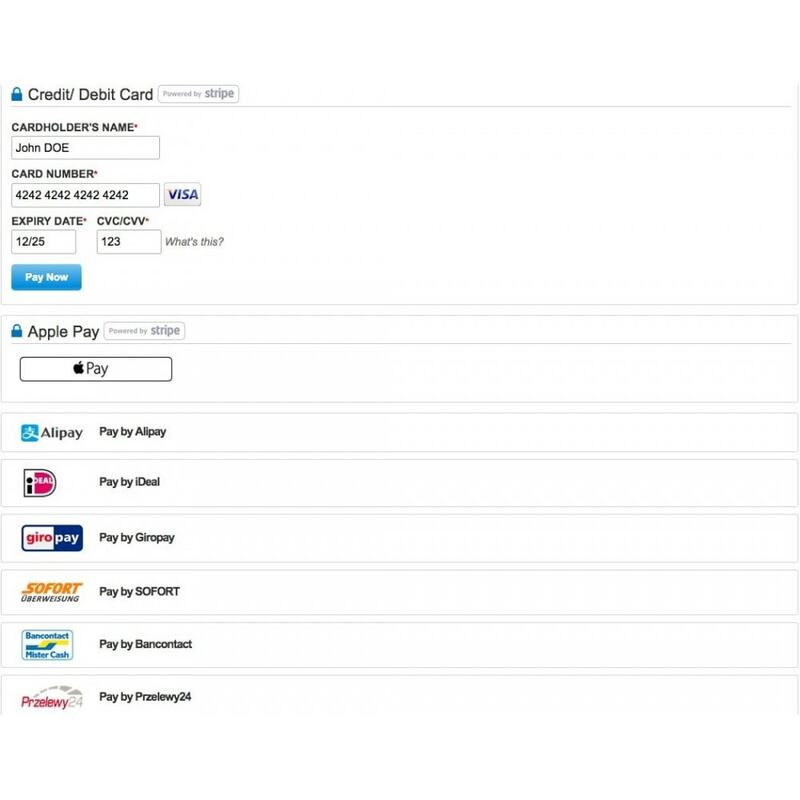 No additional charges from Apple when using Apple Pay. Offers Pay with Google, Apple Pay, Credit/Debit card, 3D-Secure, BITCOIN, ALIPAY, iDEAL, SOFORT, BANCONTACT, GIROPAY, Przelewy24, EPS, MULTIBANCO, SEPA Direct Debit with single Stripe account. 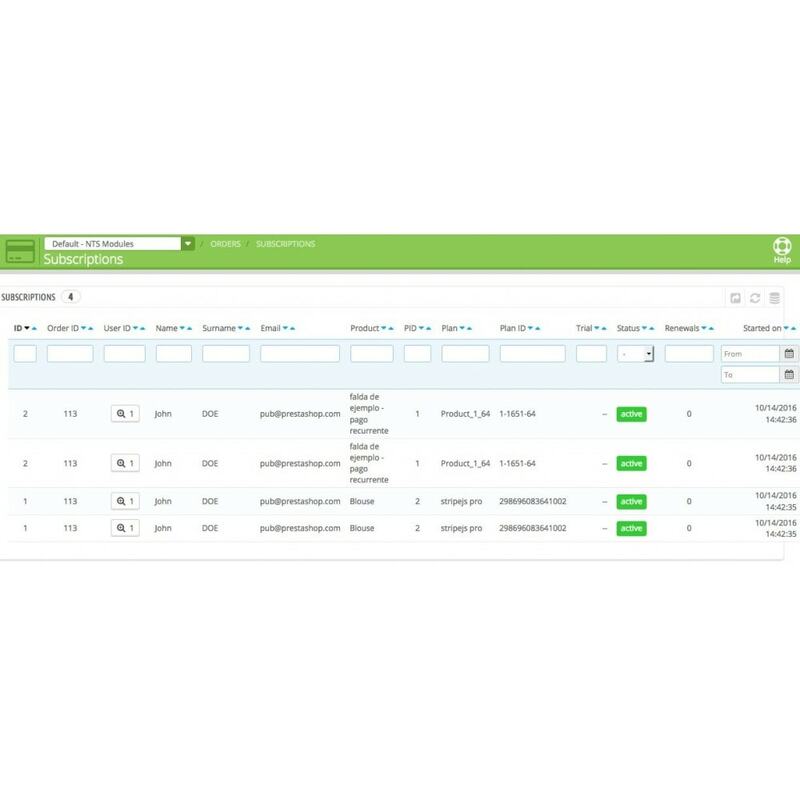 Support Recurring and non-recurring payment for single product based on its configuration. Optional shipping cost subscription to charge customers for shipping cost. 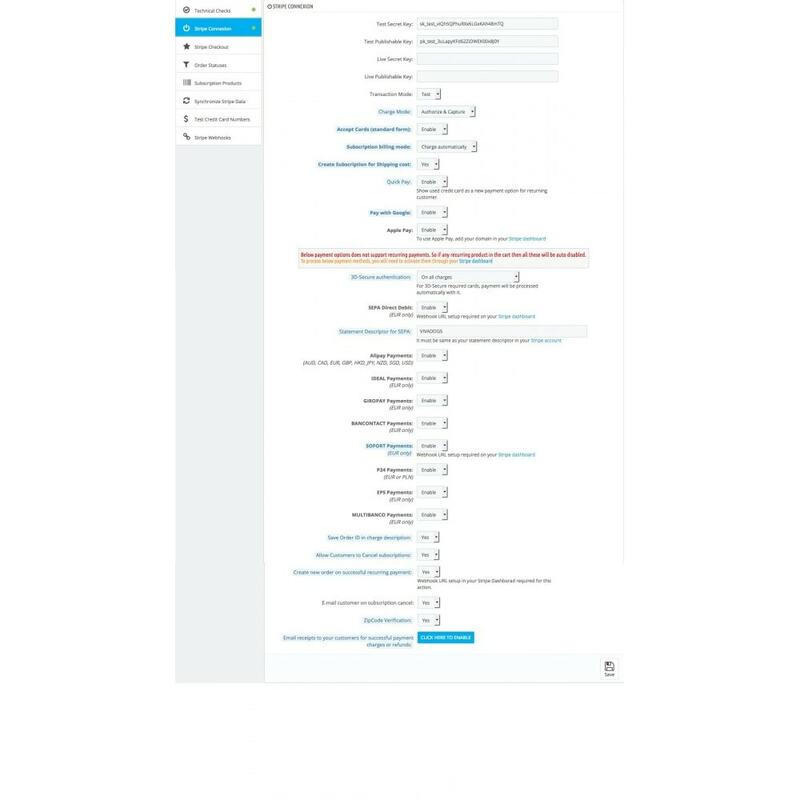 Single use payment options in the Module will be auto disabled for subscriptions product checkouts. 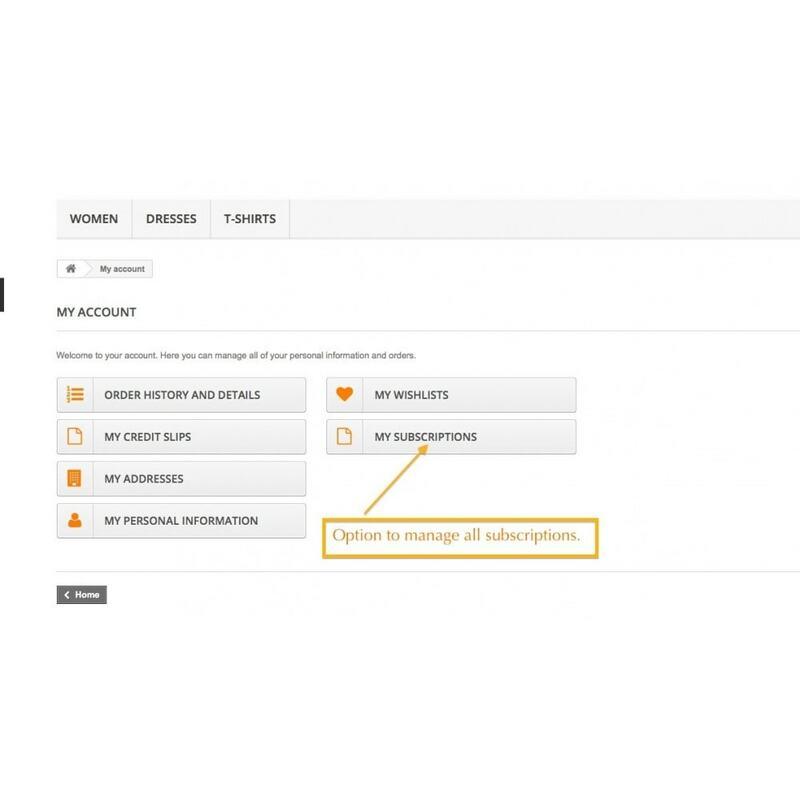 Create new orders for each successful recurring payments. 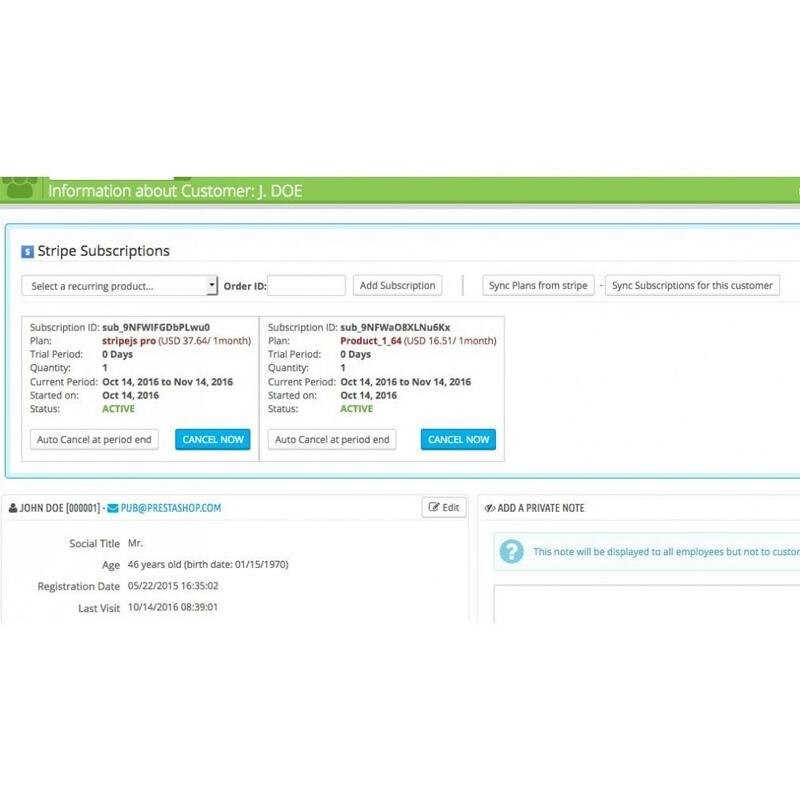 Manage multiple subscriptions for single customer from backoffice. 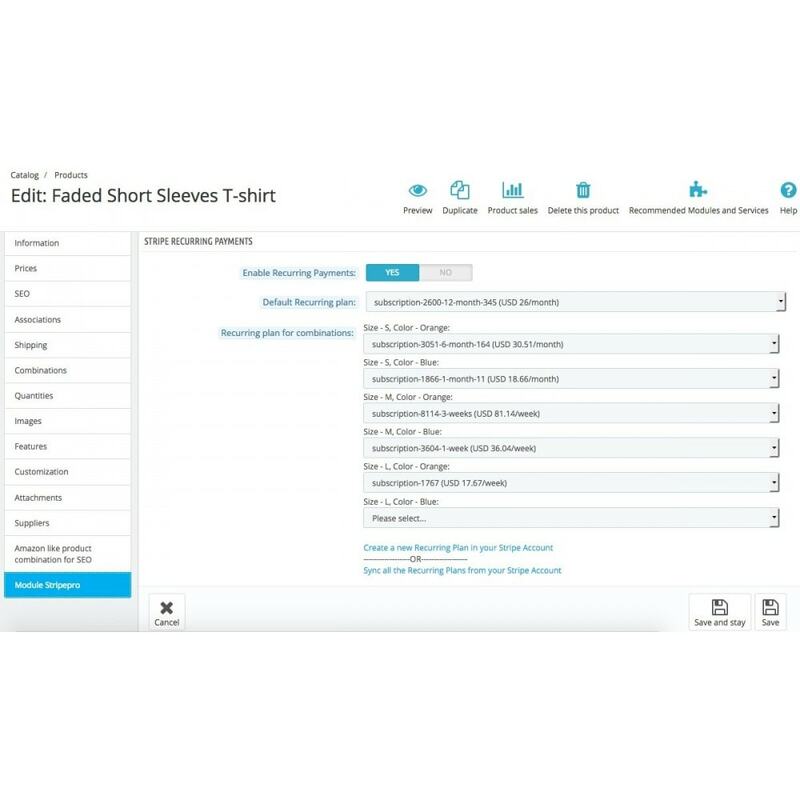 Save customer payment information for future purchases, allowing easy and quick checkout for return customers. 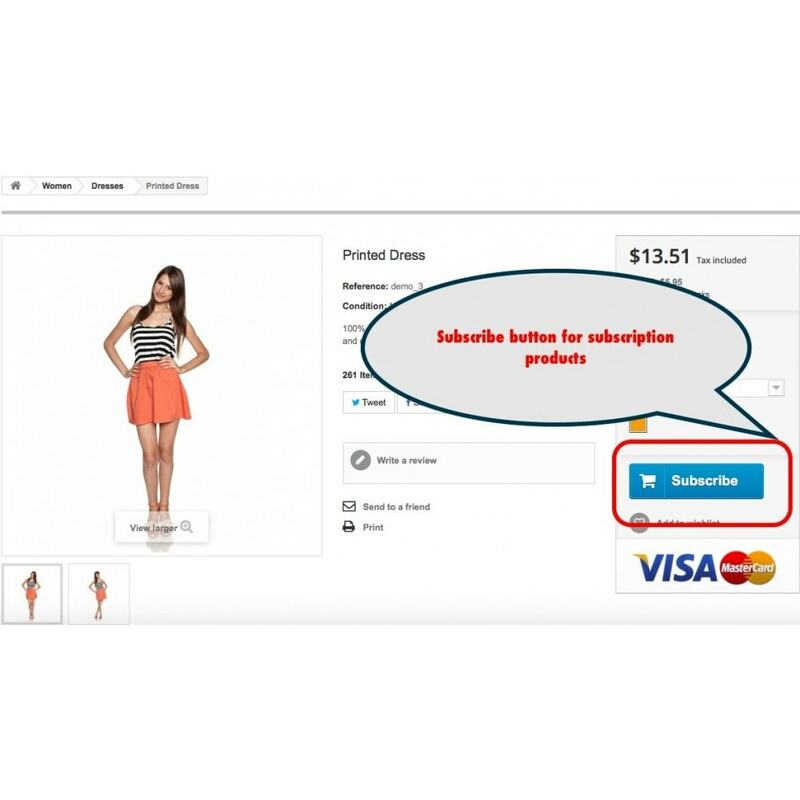 Show SUBSCRIBE button for subscription products on product page and all other product listing pages. 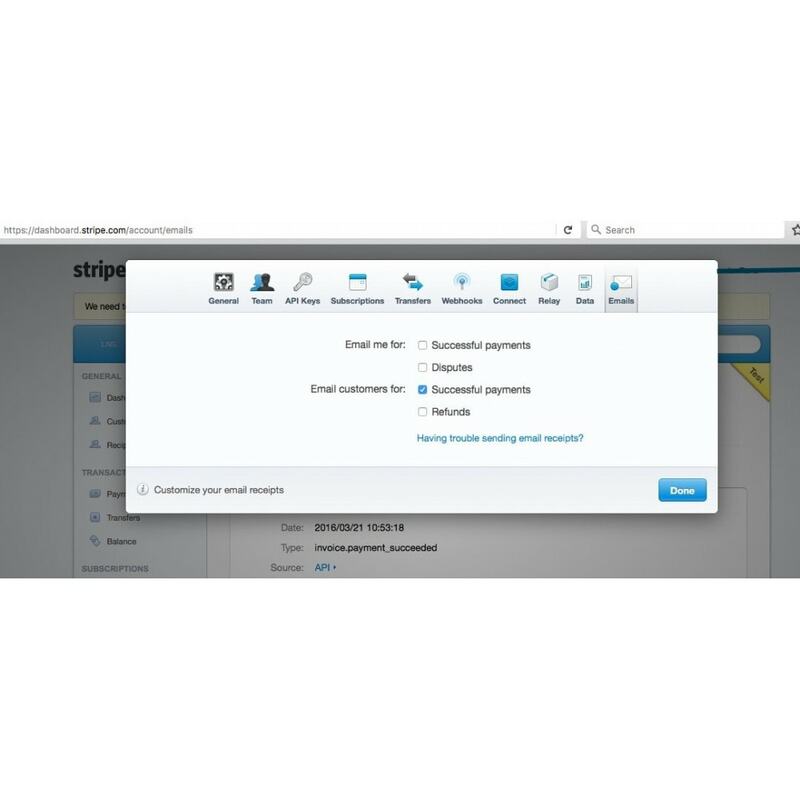 You can enable Stripe to Send Email receipts to customers for each successful payment charge and refunds. Customer loves using Pay with Google, Apple Pay & Quick Pay because it eliminates all the manual typing work for them. 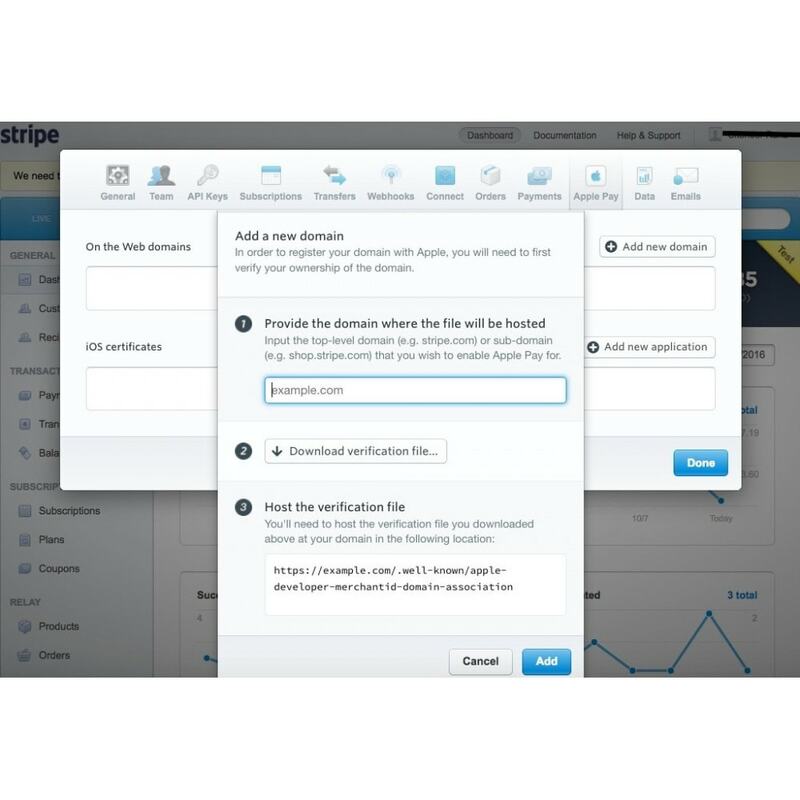 This module provides single click payments. Customers can also choose any saved card which they used in past or they can replace it with new cards. 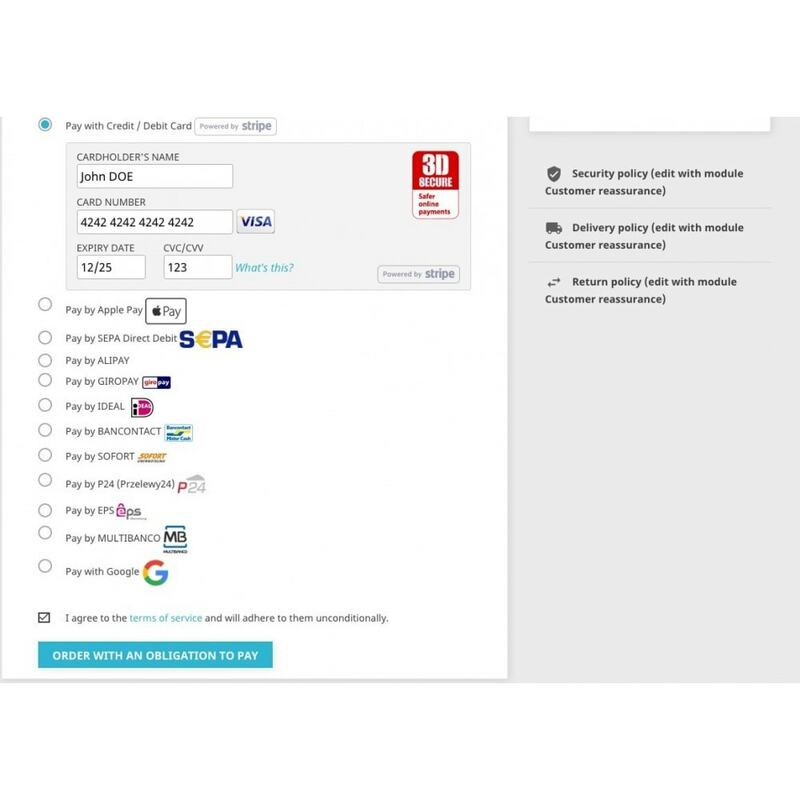 Customers can complete simple checkout process without redirecting to any other site. An SSL certificate is required when using this module in LIVEmode. 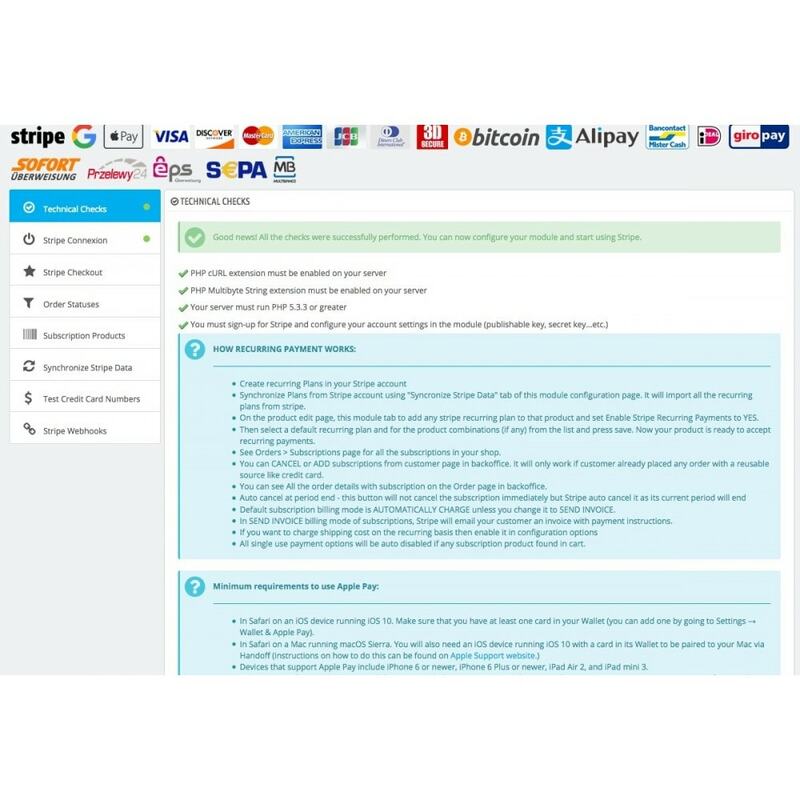 Alipay payment option has been removed from Stripe Checkout Popup and added as a separate payment option. Excellent module and even more excellent service. Highly recommended. This is one of the most amazing plugin i know. 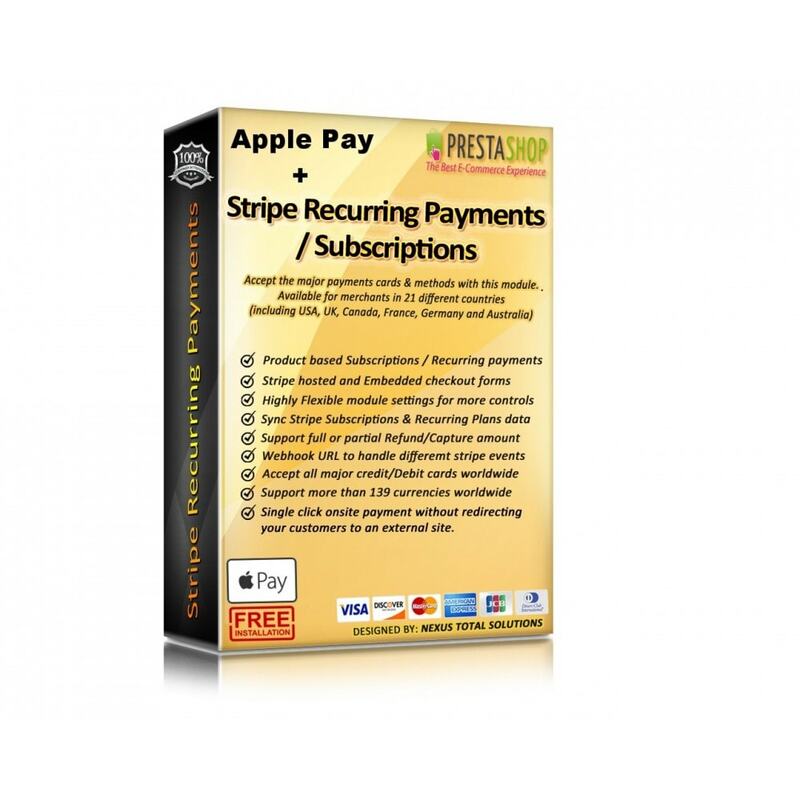 My sales increased only because it is so easy for customers to pay with the Stripe Pro II plugin. Thankyou Stripe! Support is incredible fast and really a PRO! 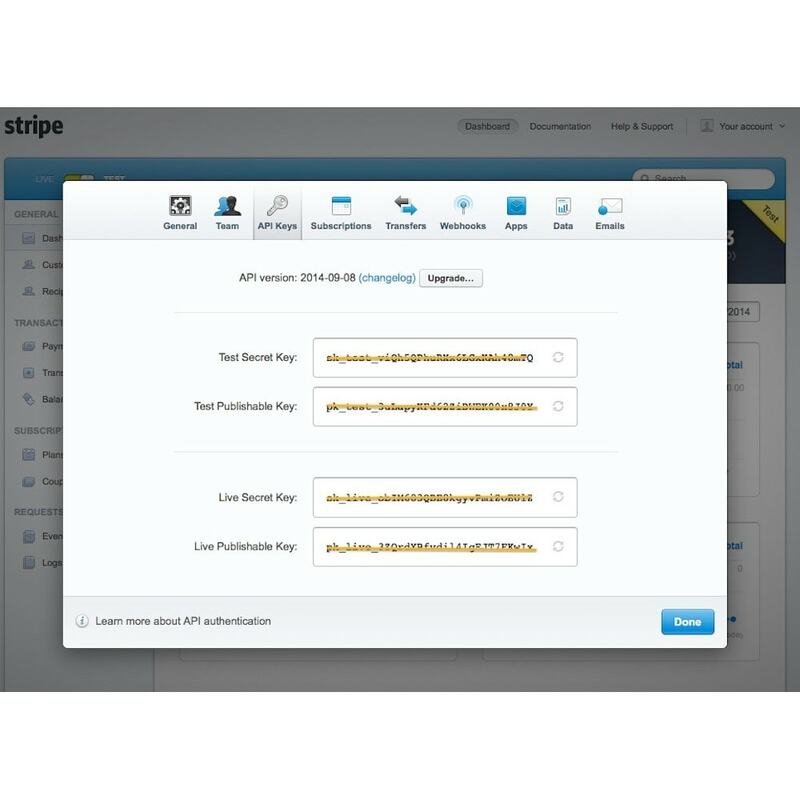 Choose Payment options, Subscription mode, Transaction mode, charge mode, fill in the Secret and Public Keys from your Stripe account. To use other payment options, you need to activate them in your Stripe account first. WeChat Pay option for single payments can also be added on request for FREE.